Insights from CXL Institute’s “State of Marketing Training 2019” report. NOTE: The charts can be downloaded at the end of this article. Training is a massive industry. 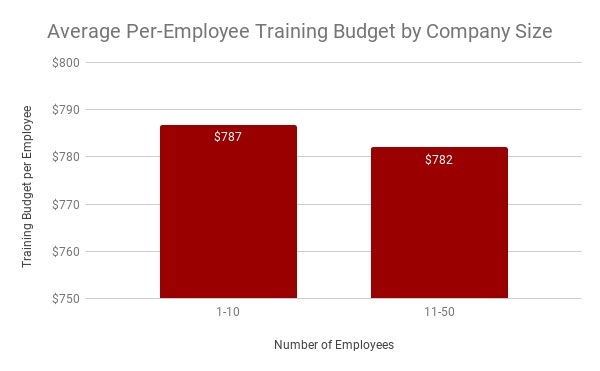 As Training magazine reported in its 2018 Training Industry Report, companies spend nearly $90 billion per year on training. 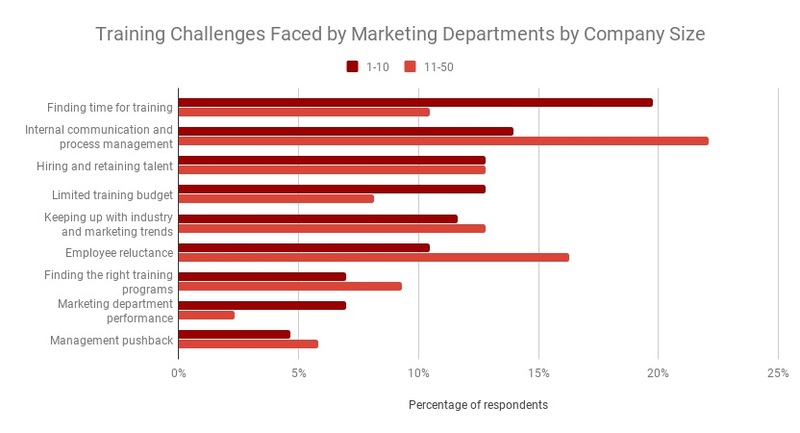 While that figure encompasses many types of training, one business department faces urgent challenges: marketing. The marketing industry continues to undergo rapid transformation, and the talent market remains exceptionally competitive. Marketing had the highest turnover rate (17 percent) of any profession in 2018. 7. 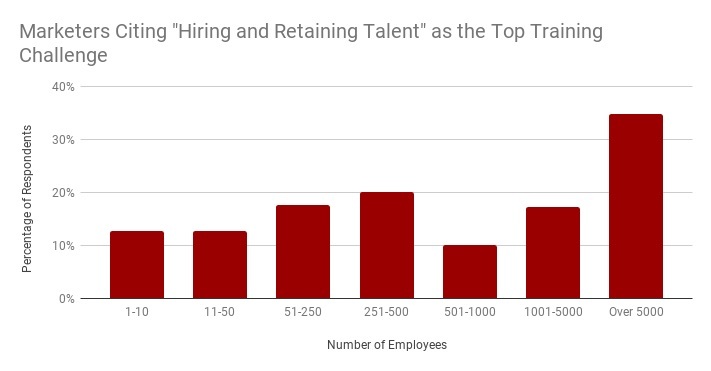 Finding talent who want to learn—and keeping them—is hard. Those seven findings have two patterns: Smaller companies struggle more than larger companies, and marketing talent remains in high demand. In this article, we wanted to share yet-unpublished segments of our original data that dive deeper into those two challenges. In general, training budgets increased along with company size. In our survey, small businesses averaged expenditures of $785 per marketing employee, while medium-size companies spent $1,099, and enterprises had an average outlay of $1,276. We can only speculate as to why budgets decline during this expansion phase. Adding new employees may divide a static training budget into thinner slices for each hire. Or fast-growing companies may not prioritize creation of a structured process for training. The latter reason, based on our data, is less unlikely. 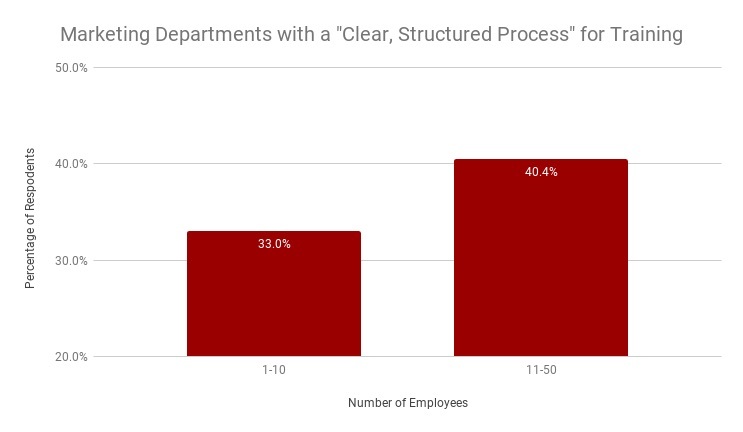 Indeed, small business with more than 10 employees reported having a “clear, structured process” for training 22.4 percent more often than those with fewer than 10 employees. Startups are focused on staying afloat. Far more often than small businesses with more than 10 employees, startups struggled with “finding time for training” and “marketing department performance.” In other words, the daily grind of generating leads for a nascent company limited training opportunities. In contrast, larger small businesses are enduring growing pains of codifying a training program. Setting up internal communication and processes is one component; earning buy-in from an ever-larger staff is another. 1. Older employees were often reluctant to change behavior or struggled to grasp new technology. 2. Fresh college grads lacked relevant technical skills and, according to some, the desire to learn them. The dual difficulty was one symptom of a larger issue for companies of all sizes: recruiting, upskilling, and retaining great marketing talent. When it comes to training employees, “hiring” and “retention” aren’t the first two words that come to mind. However, those aspects, according to our survey, influence decisions related to training programs. 1. They couldn’t afford to hire employees who came “preloaded” with the requisite skills. That made a structured, well-funded training program more essential. 2. After investing in employees, CMOs and marketing VPs worried that the added skills would simply make employees more attractive to other companies. Training has the potential to solve half the problem. For those who can’t find or afford “top talent,” training has the potential to turn smart, curious employees into skilled, technical practitioners. Keeping those employees after they’re trained is a larger issue, one that includes offering competitive compensation and maintaining an alluring company culture. The full results of CXL Institute’s State of Marketing Training 2019 survey are available here. The charts can be downloaded at the end of this article. Derek Gleason is the Content Lead at CXL Institute. CXL Institute offers digital marketing training courses taught by the top 1 percent of practitioners.